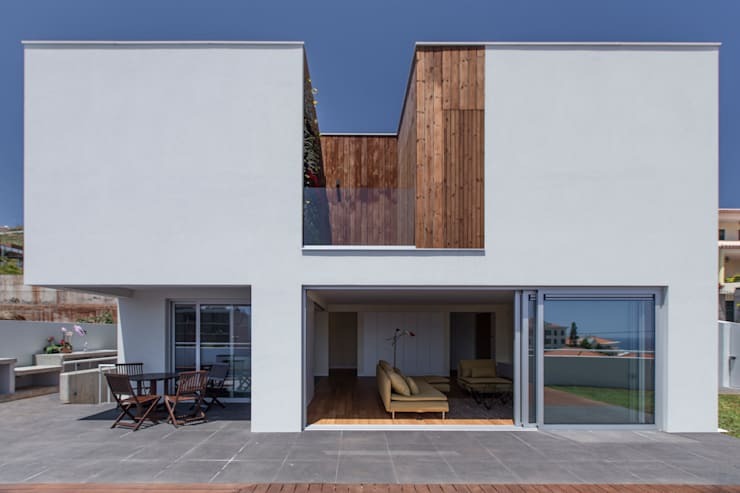 Designed by Studio Dois, today's piece of architecture is one that will warm the cockles of your heart. Modern, light and spacious, it is a home where you could write your famous novel, meditate under the stars or cook up a feast for a thousand guests. Today we are going to see how trendy design meets acute functionality. Joseph B. Wirthlin once said, Some memories are unforgettable, remaining ever vivid and heartwarming! That's what this home is—a beacon of gorgeous architecture and heartwarming design. The first glimpse of the house shows us how unique, trendy and minimalist the design is. Essentially it is a white cube, with wooden sections carved into it. 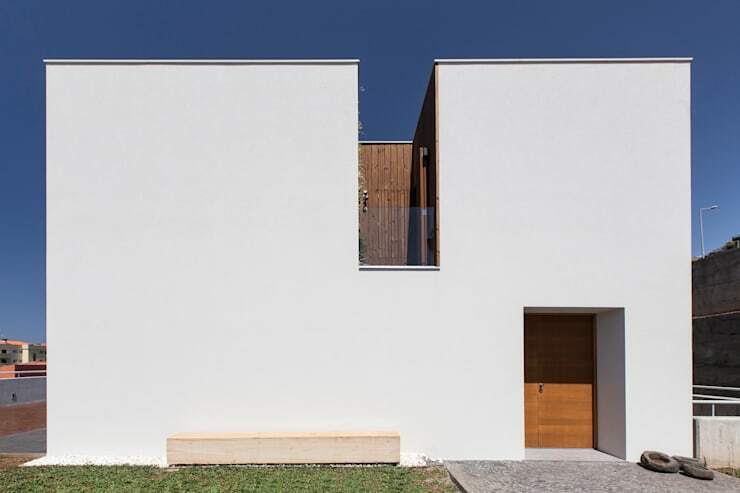 White is a great colour for the exterior, especially for a bigger house, as it is very subtle and understated. In this case, the wooden doors break up the monotony, however, adding a bit of texture and tone to the exterior look and feel. When we get around this side of the house, we can see how the block gives way to beautiful, little sections of the home—both interior and exterior—which look like little caves. The wood is a bit more prominent here, as are sections of glass. These work beautifully with the charcoal tiles, coming together in aesthetic harmony. A terrace is a wonderful addition to any home, providing an outside space where the family can dine in the sunshine, sunbathe, play games or braai. If you have an outside terrace, be sure to include some shaded or covered areas so you can still enjoy the space even when it's rainy, windy or too sunny. If we move inside the house, we can see that the interior opens up onto the exterior thanks to gorgeous glass sliding doors, which form a very transparent barrier between the two. This allows for a wonderful flow and makes the social space look much bigger. 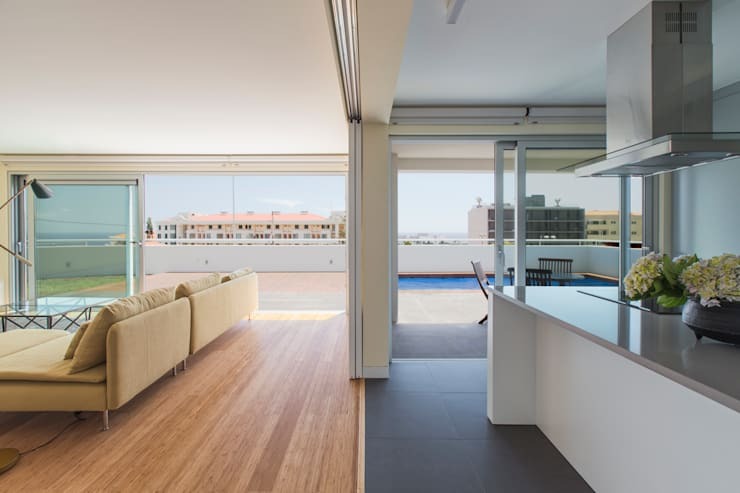 We can also see that while the living room and kitchen are open plan, there is a way to close them off from one another thanks to sliding glass doors. The designers have opted for light wooden floors in the living room, which work beautifully with the beige/yellow sofas. In the kitchen, they've gone for black tiled floors and white counters—sleek and smart. Check out these tips on adding modern spice to kitchen walls. Thanks to the large glass windows and doors, an abundance of light filters into this space, which is the ultimate decor tip! A wonderful, modern element when it comes to interior design and home decor is utilising vertical spaces, especially to add a touch of green to a space. 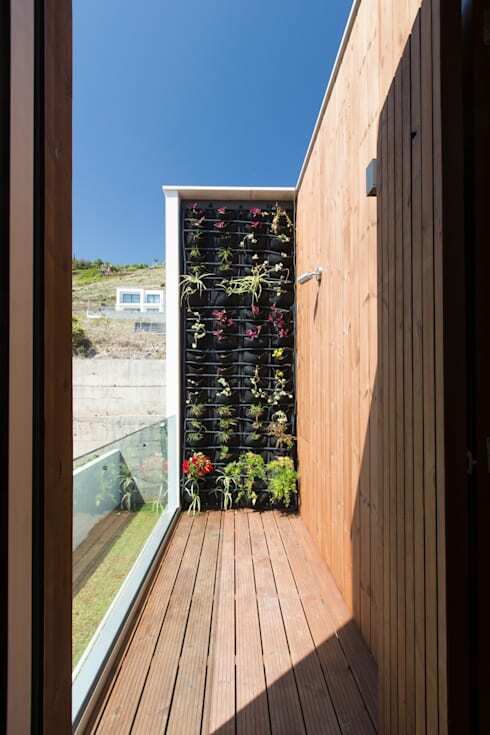 Here we can see that the designers have hung up a vertical garden, using old pockets. These create the perfect little pouches for colourful flowers, plants and shrubs. It also transforms the exterior of the house from something plain into something creative and bright. Also read this tips on how to improve your garden over a weekend. 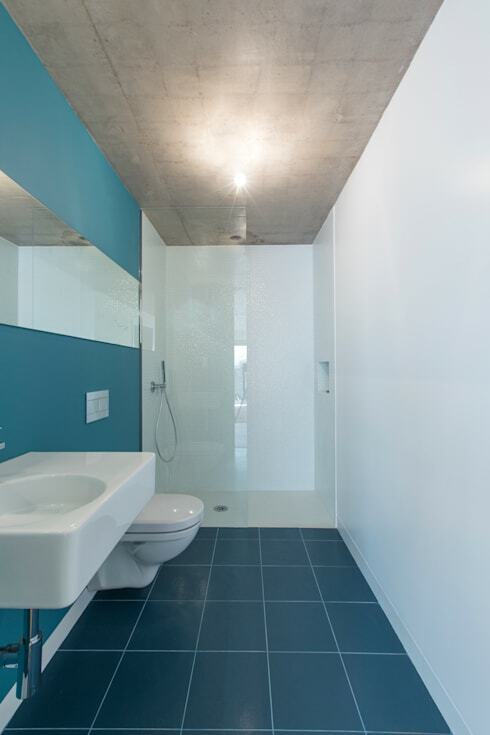 Even the bathroom in this home is sophisticated and sleek, with beautiful blue tiles and beautiful blue walls. This contrasts with the grey cement roof, stark white walls and bathroom features and glass shower. Don't you want to hop in this shower right now? It looks so relaxing and modern! Whether you have a small bathroom or a big bathroom, it's a good idea to keep your personal possessions out of sight, so that your bathroom always looks clean and neat. Invest in some cupboards under the sink. You'll also notice that these designers have put a long, narrow mirror up across the bathroom wall. Mirrors can really give the illusion of a bigger space so put them up in any small room! This is a home that packs a punch! Can you picture living in this home in your neighbourhood?